Looking For A Professional Team To Install Your Chimney Cap Or Lock-Top Damper? Are you looking for a professional and reliable company to install a new chimney cap or lock-top damper on your chimney system? We can help! The team at Copper Top specializes in chimney cap and lock-top damper installations and can make sure your system is properly protected. We’ve served hundreds of our neighbors in Atlanta, Augusta, Chattanooga, and the surrounding communities, and have earned hundreds of positive reviews. We’re also honored to be recipients of the Home Advisor seal of approval, the “Best Of” award, and more than 20 Angie’s List Super Service Awards. Honest, customer-focused service is what we’re all about! Lock-top dampers can replace throat dampers to close off the chimney flue when the fireplace or stove is not in use. When closed, the lock-top damper’s rubberized seal will completely close off the flue, preventing conditioned air loss up the chimney and working to keep downdrafts from occurring. 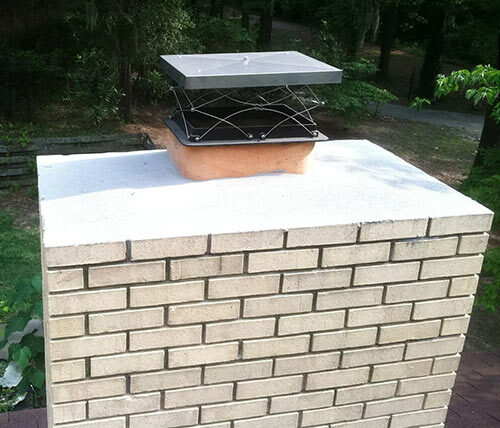 Chimney caps do not close off the flue, but simply cover and prevent moisture, animals, and debris from entering the flue. These also tend to feature spark guards, which work to keep sparks from the fire from floating out of the chimney system and igniting nearby trees or property. Many homeowners choose lock-top dampers over chimney caps for the added energy savings or simply because their existing throat damper is no longer working properly. If you aren’t sure whether a lock-top damper or a chimney cap is best for you, we’d love to discuss your options with you and help with your decision! Whatever you decide, whether you have a multi-flue chimney system or a single flue system, you can count on us for the most beautiful and long-lasting chimney caps and lock-top dampers available. Our service vans are stocked with caps and top-lock dampers for the most common flue sizes, and all of our options come with a 5-year, 10-year, or lifetime warranty. Call us at 770-944-1200 or request an appointment online – we’re here to serve you! Professional masonry waterproofing with the right products can help eliminate messy, costly chimney leaks. Ask us for more information.